Here in our motorhomes campervans open letter. We hope to answer those many questions, about what we do. We get asked, many questions such as, what are your advertising rates? How much is it to display motorhomes on your site.? Will you share our pages? May we put our campervan for sale for free! Well, we have stopped all that! Yes, for a good reason. Because, our good nature goes before us, we just like to help people! Historically, we did do some of those things. We will explain why people are now actually paying to get help; If you imagine, there are a few answers to questions, that we do not know. However, if we are asked to help anyone, we will give it a go. But, not all for free. Just how many people are wanting motorhome handbooks? Alone, at times, these requests will swamp the email inbox. However, we still enjoy helping all of our customers. If it is simple, then we are happy to help. We receive phone calls and emails, continuing to think we are a monthly motorhome magazine. That we are definitely not! We doubt they have a free help service! The main website is owned by; John Buxton Fleet management. Those who know us, will need no introductions. Those, who don’t know us, see our Linkedin profile. Or look here on the motorhomes campervans website, who we are? Anyone can become a client, all we need is you to contact motorhomes campervans. Then as with all new clients, we start by looking what online presence they have. What they are doing, good and bad. To see if we may be able to help them. Basically, we only work for clients, who need to use our platforms and understand, what we do. 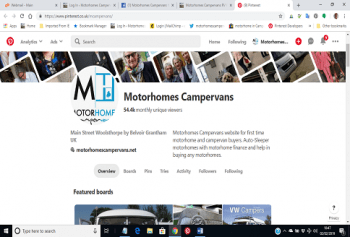 As, we have said before, we are not a monthly magazine, dressed up as an online “motorhomes for sale” add on; We look at what the online basics, the clients, may want to achieve. Obviously, more business, or to sell something. But, sometimes an online identity, with us is enough. Having a link from us has value, look online at the value of links. So, yes just to be seen to be promoted by us and what we do, has a value. Who runs the website? John and his helpers! Are you the dealer we spoke to last week? No! Are those latest offers, still running? Maybe? How may we do a deal with you? Anyway you like! Do, you know how long my motorhome is? What make and model is it? We are not sure! My motorhome door is jammed closed, can you help us? Where are you? North of Berlin! We keep finding the motorhomes campervans website online. That is good to know! There are some great blogs on your website. Yes, we wrote most of them! Do you have a blog on taking your dog with you? Taking where to? Our customers like your blogs, they are informative. Thanks, we think that a well! We enjoy dealing with all our customers. Especially, the motorhome manufacturers and motorhome dealers. Let’s face it, they are the lifeblood of our industry. But, without you, the customers, reading this, it would all end here. Because, we love reading about the many great brand new motorhomes and campervans. Especially, the ones with really new designs and layouts. Environmental, friendly motorhomes are always of interest. With 2019 many more new models, will becoming available, in the UK. The motorhome ownership car park is growing. Whilst, there are some great used motorhomes for sale. There remains a shortage of good ones. Because, they only sell thousands of motorhomes a year, not millions, like cars. Most people keep their motorhome for over 3 years. So, that restricts the number of used ones for sale! Yes, it is hard to keep up with all the information. Therefore, at this point, lets just say thanks for the interest in our motorhome services. The motorhome topics and searches are endless. So, just how do we help? We use our social media platforms. From our point of view we know. That is the most powerful way to promote a motorhome or campervan topic. PS; Why did we decide on an open letter? Just what is an open letter? “a letter addressed to persons or a group of people. But, intended for publication in a newspaper or journal”. We have nothing to hide, we do, what we do. Making it as easy for anyone to use our services. We have discovered that we actually bring clarity to many things. Unless you try us, you will never know. We are linked to many different people, many known to us from our background working with corporate clients. Others are motorhome people at all levels. We share the articles related to clients and all blogs go this route as well. 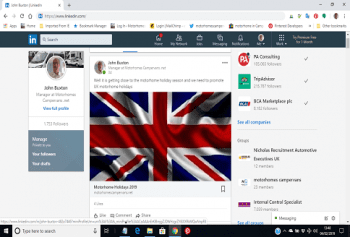 There are business users use, we do have a business page on linkedin. But, tend to publish articles and use the individual posts. LinkedIn provides us with a professional way to reach a large audience. We have many different types of contacts, even on Google + that ends shortly. We just do all we can to provide good information on service via the platforms. Pinterest provides over 50K unique monthly visitors! Twitter we have 2,911 followers and growing daily! We believe our used motorhomes for sale page of Facebook, is a little unique in its own right. LinkedIn; The professionals website, that just keeps growing. You need to find someone or have the potential of a job then LinkedIn may have the answer. We post onto our profile and share articles, with other motorhome and campervan people. We have quite a following of what we do and often get questions about motorhomes in general. So, as our posts and articles grow, so does our followers. 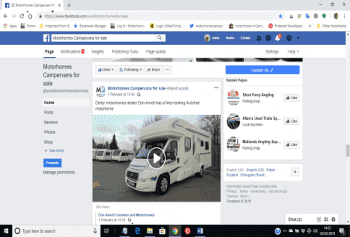 Facebook used motorhomes for sale; We set up the simple used motorhomes for sale, Facebook page. It just works away in the background. We place articles on it as well. Because, we have 1,095 likes from various followers. Many that have grown organically. We have a cross section of buyers and sellers liking the page. The way forward is to continue, to attract many more motorhome or campervan owners. We are quite happy to allow posts, that are about new and used motorhomes on this page. We find that they get liked quickly. We try to just keep posting, as stock comes in. We leave sold motorhomes on the posts. Thus, taking the view a customer, may want a similar models. The followers are not just all UK based, they do come from other places, like Europe. 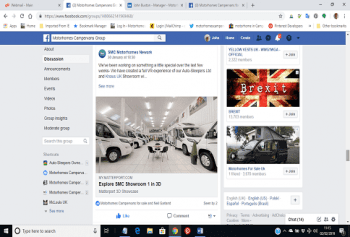 Facebook motorhomes campervans group; The motorhomes campervans Facebook group site is an emergence of the other Facebook pages. This was done late last year, with no promotion being carried out. The idea is it will build itself and people who are motorhome related owners or dealers. May use and join in for free. We have seen the power of Facebook group pages. However, we don’t want to adopt a sign up anyone approach. Many other groups do. However, we want to target motorhome or campervan owners, manufacturers and dealers. Especially, anyone who blogs about motorhomes and campervans travel stopovers and campsites. This will grow, but, we want this to be organic growth. Private sellers are welcome, as are motorhome manufacturers and motorhome dealers stock. Twitter; We have never gone out to get followers, we now have 2,909 followers right now and growing. This provides a target for us to follow back. Again, we try to look for on topic stuff. Especially, if they are motorhome travel or stopover type destinations. We retweet all our customers articles. We have many easy ways to tweet actual motorhomes for sale. On a share basis, we also re tweet most of what a client is putting out there. Pinterest; Our boards, have been building for some time now. Yes, we fluctuate around 50K plus unique monthly visitors. We have different boards and our age of pins is around leisure vehicles. Also, adopting UK designers. The idea has been to build boards, for motorhome manufacturers. Building on places to travel and then place pins, back to the motorhome dealers. Promoting, pictures and articles. Pinterest just grows and flows traffic, back to our website. 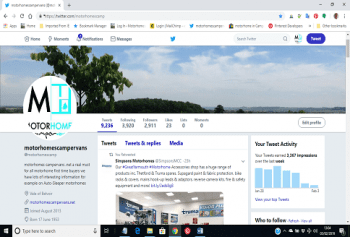 Our social media platforms, provide ways, to promote aspects of the motorhome and campervan trade. A new model launch, is one thing we love doing, nothing better than a new story. You may not have time, to attend a motorhome show or a launch day at a motorhome dealers. However, online this follows on, with leads of interest in the products. Then when you have sales and success for the vendors or the motorhome manufacturers. The flood gates open up. Having motorhomes with a top pedigree certainly helps to get a good start.